Happy New Year everyone! I hope this year will be full of new and interesting fashion doll news that we can talk about and share here. Fashion Inspiration is always a fun thing to speculate on when a new set of dolls is released from Mattel or Integrity Toys. There are some very good fashion sleuths in our collecting community that post possible inspirations for these new and old fashion dolls. I don’t know if it is the history lover or the fashion lover in me that enjoys this information. I guess it doesn’t really matter..I just think it is fun to see the possible inspiration that designers at Mattel or IT use to design a particular doll. My friend Hilda of Bellissima Couture found a fashion and posted it on Pinterest the other day. It was a dress by Jason Wu and I instantly recognized it. It was a gown I had seen on a Fashion Royalty doll. 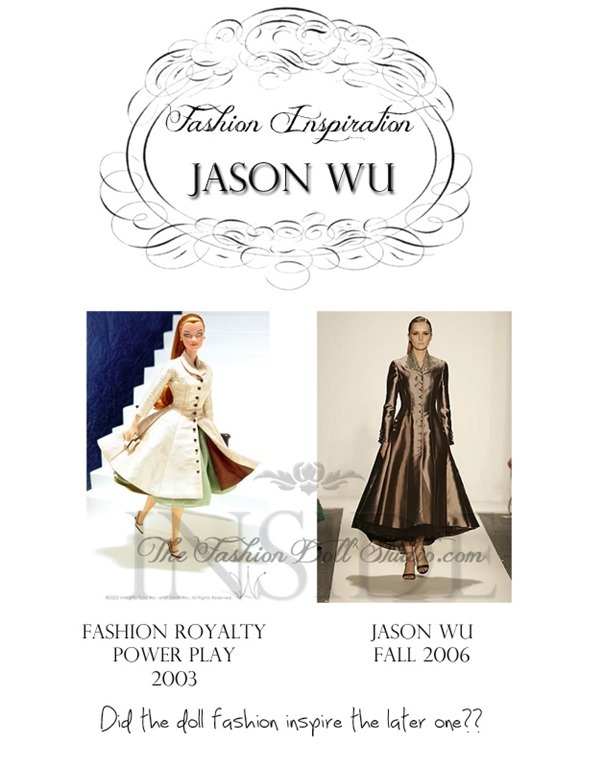 It was not surprising…given that Jason Wu designed the doll for Integrity Toys. Typically, a doll is released and I love to look back in history at fashion shows of popular designers to see if I can spot an inspiration. 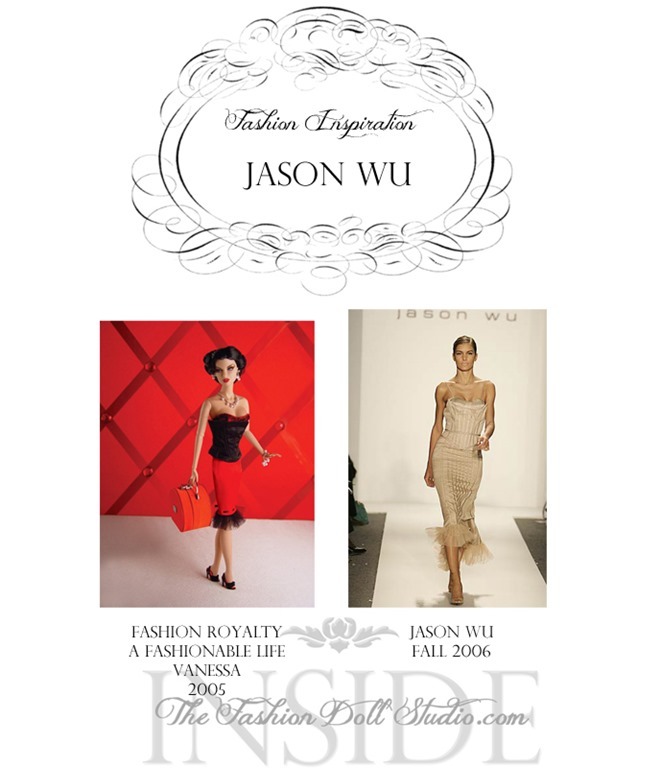 It started me thinking…Jason Wu started as a doll designer…was there inspiration coming the other way? In other words, could we look back at previous doll designs and see inspiration for the amazing designer he was to become. I think I may have found a few. Whichever way inspiration goes, from the fashion world to the doll design arena or vice versa, that connection with fashion past and present is a big part of collecting for me. It is so interesting to me to see how they influence each other. This entry was posted on January 1, 2014 by raberry65. It was filed under Fashion Royalty and was tagged with Fashion Inspiration, Fashion Royalty, Fashion Royalty Fashionable Life Vanessa, Fashion Royalty Haute Luxuries Vanessa, Fashion Royalty Power Play, Integrity Toys, ITFDS, Jason Wu, Jason Wu Design, Spectacular Spectacular Eugenia. I had even a modicum of knowledge of fashion – Happy (and safe) New Years to you, raberry, and to all! Happy new year Rebbeca and family! ach, sorry that should be Rebecca, my tablet remembers even my bad spelling. oy!! I have run up to the desktop for this one. Have a great day and best wishes for 1014. Wu is great, right from the start, I met him when he was only 16 or so in Toronto, I am ever amazed at how his career has gone and I should have seen it back then how far he would go. A wonder really. haha, I just notice 1014, hehe how would that be? I have been sidetracked by watching Sherlock, leading up to the new ones, and DA starts on Sunday. This will only be my second time watching the Sherlock episodes, it is obvious why both these actors are at the top of their game now. Glad they came back to give us a few more episodes. Happy new year to you too, Rebecca! 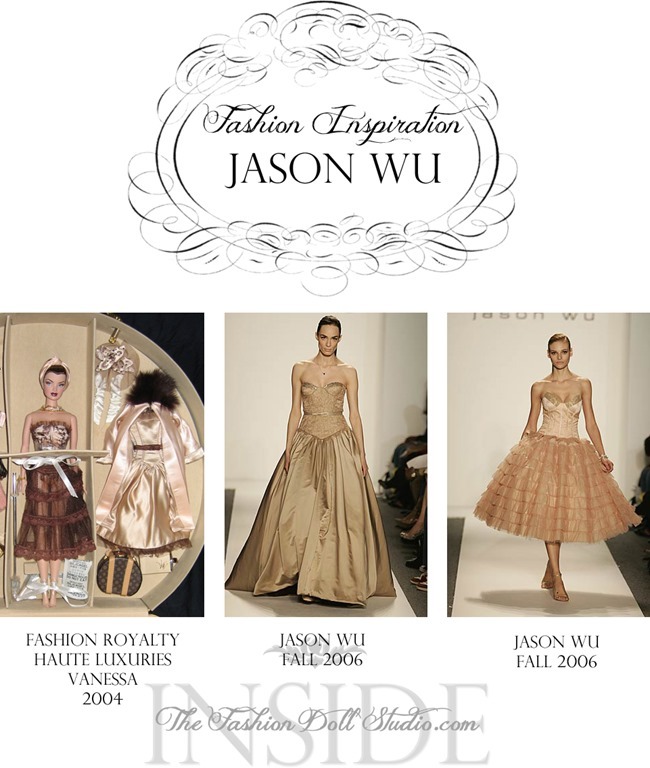 Il looks like there’s a biunivocal relationship between Jason Wu Fashions and what he designs for Integrity, it looks like sometimes the inspiration comes from the dolls!!! 🙂 Ohhhhhh! extra credit to you for including a mathematical term in your response! 🙂 I actually had to look that one up 😉 Love it! Wish I could have used this word in the post itself. Yes, definitely a symbiotic relationship…and it is so cool to see it go both ways. I agree…I love history of any kind, but especially anything to do with Barbie and fashion. Great inspiration either way it happened.